For those not at the mercy of Cablevision’s stranglehold on cable television provisions up here in the northeast, it is important to begin this week with what corporate shenanigans have been transpiring over the past fourteen days. News Corp, which owns the Fox Network, has pulled its product from Cablevision because it maintains that not only has the cable provider asked to pay a bundled discount for content without paying for the full package, but Cablevision has charged its customers, of which I am one, for said content without forwarding a substantial portion of these charges into the News Corp. bank account. News Corp. also argues that these alleged charges are not attached to rival ABC, NBC or CBS network programming. Cablevision responds by claiming it pays a competitive rate to News Corp. for the right to include its stations on the basic cable package and in so doing has already forked over what was negotiated; despite News Corp. whining that it costs considerably more than other networks to produce its “high quality” content. Cablevision, which has gorged consumers for decades with hidden rate hikes backed by ambiguously half-assed rhetoric, says it does not want to pay News Corp. a dime more than agreed so as to not have to raise the current rates, thus putting its customers, which again I am one, under siege by a salacious corporate monster, of which, let’s face it, Cablevision can consider itself counted. And although it is propaganda worthy of P.T. Barnum, Cablevision has likely nailed it on the head. 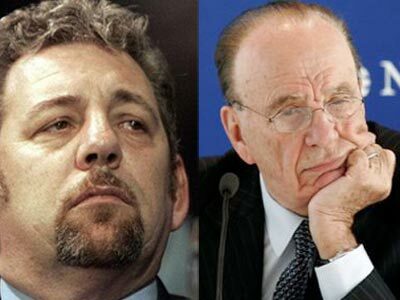 I am sure News Corp. is a salacious corporate monster. Problem here is I do not pay a monthly stipend to News Corp. I, as every last Cablevision customer, make out a check payable to Cablevision. You see where we’re going here? At around the seven-day mark of this stand-off, or about a day or so before we all realized around here the N.Y. Yankees wouldn’t be defending its title in this year’s World Series — broadcasted by Fox — I placed a call to Cablevision customer service. A lovely woman by the name of Roslyn answered. Roslyn, bless her heart, then proceeded to read awkwardly from a prepared script about the ongoing negotiations, a nod to FCC regulations, and a bit on the ideas of “bargaining in good faith”. She continued politely, if not disingenuously, to offer a series of canned apologies, which concluded with a promise that when all this is sorted out customers will be duly apprised of the next step. Once again, as if I had merely recited the alphabet or sung the final stanza of “Hey Jude” rather than offer a rational argument, Roslyn politely read from her script. Before she could finish, I inquired as nicely as I could if she would be happy perhaps working an extra four hours a week for the same pay as she now receives, or more to the point, if she would have an issue with her hour lunch breaks being reduced to half an hour with no fair reparations. There was apparently no script for this part, for Roslyn responded with stone silence. To her credit, Roslyn exited the logic train here and asked if I’d be more comfortable speaking with management. I agreed it would be best, but alas when she returned she instead gave me the press relations number in Long Island at Cablevision headquarters. I called that number a day or so later, perhaps the Tuesday of this week, and received assurances from an amiable Lisa that a misters Charlie Shueler Executive VP of Communications and Jim Maiella Vice President of Media Relations Cable & Communications would be contacting me before my noon, Friday deadline. Nothing by Thursday prompted me to call again. After further assurances from Lisa, the core of which had now begun to resemble the trade value of air, she provided me with the direct number for Mr. Maiella’s office. Since Lisa worked for Charles Shueler, you didn’t have to be Sherlock Holmes to deduce this line of pass-the-buck. Friday morning around nine, I phoned Maiella’s office and spoke to his secretary. I could tell by her disappointed tone, she knew right away my identity and purpose, and after putting me on hold, said Maiella was unavailable at the moment, but would call me at home before my deadline. And so, we can conclude that it is Cablevision’s official policy at this time and place — not a magical future date and time — that it will continue to charge its customers the same rate for half a bagel. “I would like you to offer something on the record. I pretty much laid out my timeline on contacting Cablevision in the piece and it unfortunately or perhaps fortunately led to you. I think the fair thing for my readers is to have something on the record from someone at the company. If not you, is there anyone who would give me a direct quote, so I can conclude my story? I assure you this is not a hatchet job or an end-around. I simply would like a “Listen, we’re through the looking glass here” or “We haven’t dealt with” or something. Maybe it is a “stay tuned” situation, which I am sure you are accustomed to, but I need a quote of some kind. I concluded by asking if he’d like to speak directly. Nothing until nearly eleven, when I called and caught a none-too-pleased Mr. Maiella, who at first demonstratively asked if this was (using my terminology) a hatchet job — perfectly describing the timeline story, but couching it in demeaning terms. I had to agree that although it was a “timeline piece” replete with mockery, but it was in my own unique and lovable idiom and without template and hardly an agenda beyond wanting to receive a simple answer. The length and breadth of our nearly twenty minute discussion had to be off the record –take that how you wish — in which Mr. Maiella, a pretty stand-up fellow in a pretty damnable situation, tried to make the case that programming costs drive up rates and that Cablevision’s phone and internet rates have not increased in seven years. He also basically agreed with some humor that my “baked bread analogy” was apt when considering that if I went to buy a bagel and the baker was selling me half a bagel at the original price to avoid having to charge me twice as much for a full one due to a flour price increase I might be incredulous. “It doesn’t seem like you’re getting into the substance of what they want and what we’re trying to be more reasonable about,” Maiella asked. I send this to press at 12:29 pm on Friday with no other statement. Information I received some eight days and twelve or so phone calls ago From Roslyn.